OOHOOD shook the tag of "Australia's best maiden" with a thrilling victory in the Group 1 Flight Stakes (1600m) at Royal Randwick on Saturday. 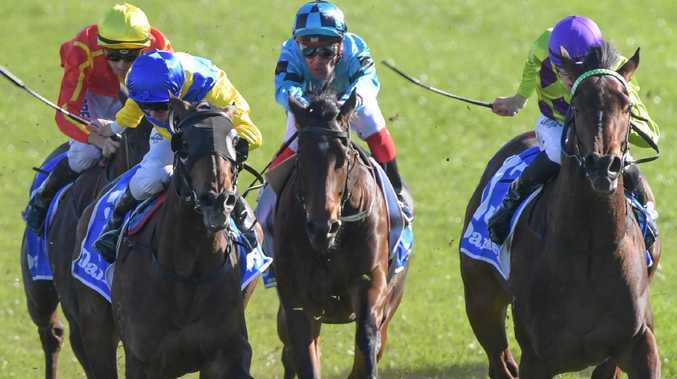 The Tony McEvoy-trained three-year-old had earned more than $1 million before Saturday's race after running placings in the Blue Diamond Stakes, Golden Slipper and Sires' Produce Stakes in the autumn but was without a win in nine starts. That all changed when Tim Clark rode her quiet in the 13-horse field before she let down to win a three-way photo finish from Fiesta and Nakeeta Jane. "I feel a bit numb and it's a great relief," McEvoy said. "I just wish the Sheikh (Bin Khalifa Al Maktoum) was here to see her win a Group 1. He was here in the autumn when she just missed out in the Sires Produce Stakes, she deserves this. She was stiff in the Blue Diamond, stiff in the Slipper I thought and the Sires, too." There was a point in the Flight Stakes when McEvoy thought she was going to be the hard-luck story again but she dug deep to take a few lengths off Fiesta and favourite Miss Fabulass in the final 200m. "When they were coming up the straight I thought 'Oh no, here we go again. Not another close finish, not another narrow defeat', thank god she put her nose out for us," McEvoy said. Jockey Tim Clark had been on Oohood at all three previous runs this preparation and his loyalty paid off. "I chased the ride quite a few months ago," Clark said. "She was looking as though she might not have quite come up even though she was running well without getting the job done. "I rode her quiet and tried to forget about the race early and let her be strong late. It was a bit messy but she knuckled down and got there. "I thought she might have appreciated a bit of rain and riding hr quite was going to be make-or-break as to whether that was going to be the difference." McEvoy and Oohood will take on The Autumn Sun in the Group 1 Caulfield Guineas next start on October 13. "It will be tough to take the boys on but she loves it tough," he said. "She was better than all the colts through her two-year-old days. Even though she didn't win she beat the colts home and let's see if she can do it again now." Miss Fabulass was arguably the run of the race in fourth after she over-raced. "She refused to settle for me. Pace wasn't that strong. 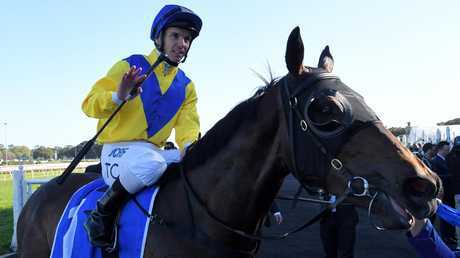 Got to the point that was nearly clipping heels," jockey Kerrin McEvoy said.